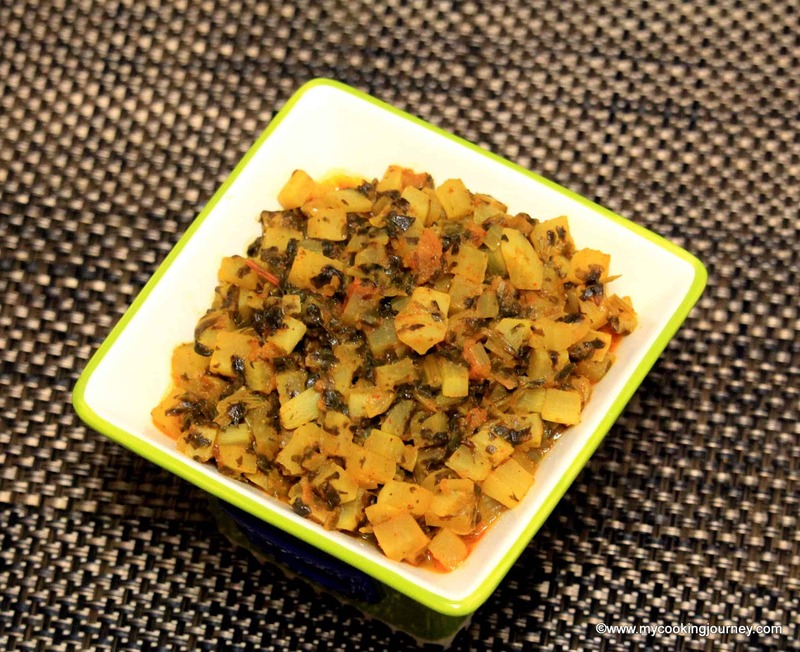 is a great side dish with some Phulkas / rotis and rice. 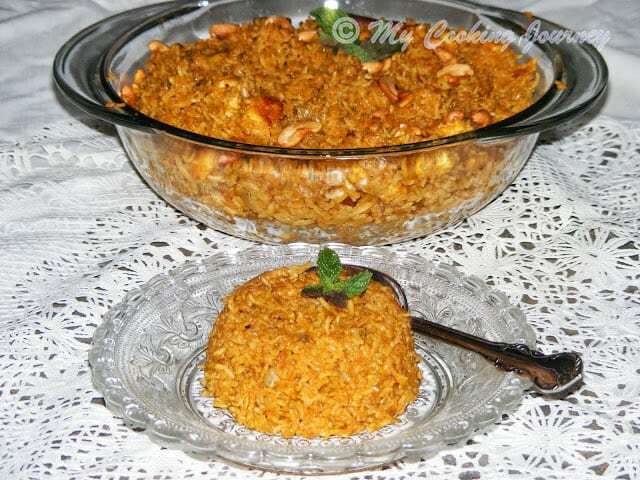 This is the third recipe that I am updating my pictures. It is always such a pleasure to go back and see the posts from almost 6 years back. We had a huge vegetable patch in our backyard and I had cooked this particular post from the freshly harvested spinach from our backyard. 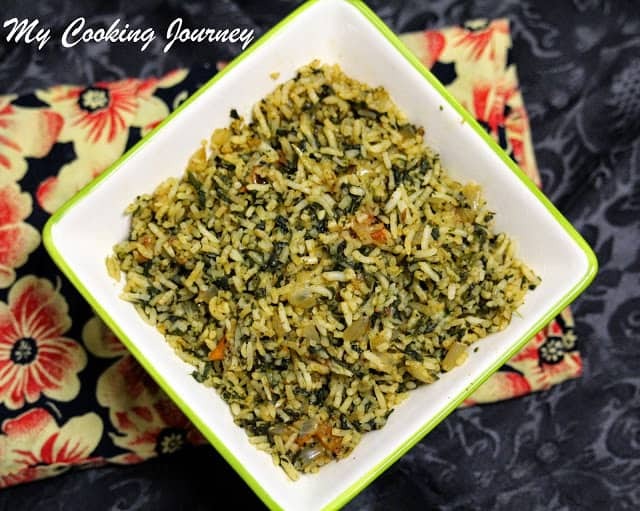 This time when I redid the recipe, I did not have the privilege to use home grown spinach. Last week we had been to the Vietnamese stores in Oklahoma City and I could not resist the fresh bunches of spinach in the store. 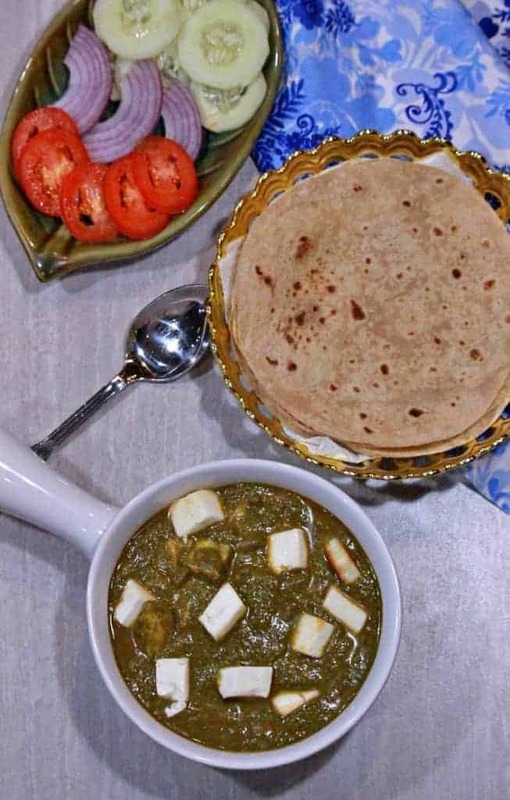 I bought couple of bunches and made Palak Paneer for dinner. 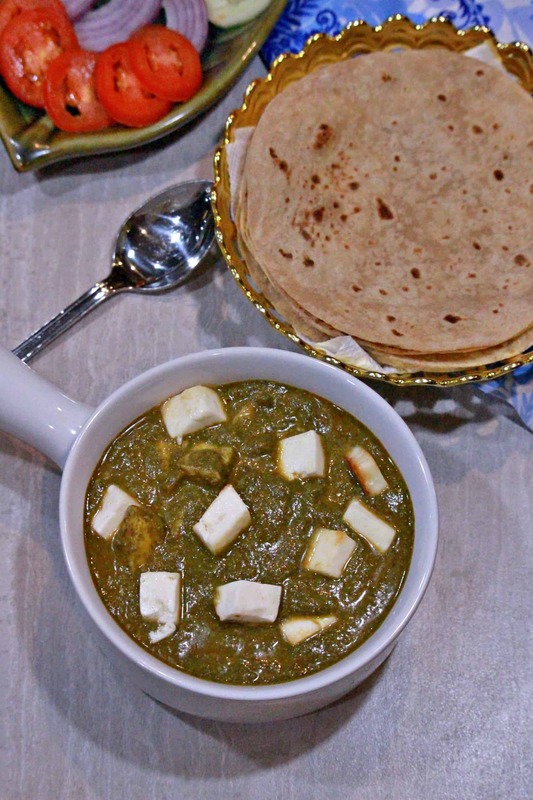 I use either paneer or tofu when making Palak paneer. 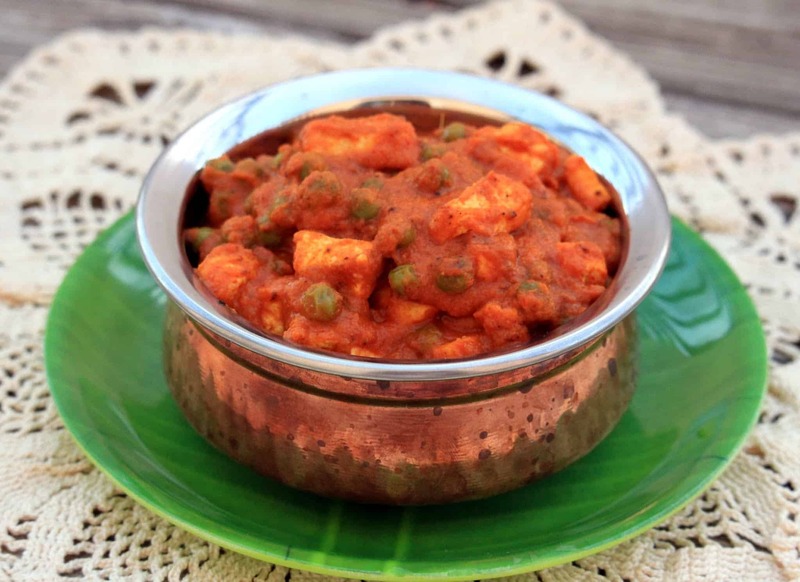 My boys like both paneer and tofu and hence I use whatever I have in the refrigerator. This time, I had paneer in hand and hence used it to make the subzi. I treat both the paneer and tofu the same way and briefly pan fry them to give a little color. If using tofu, make sure to weigh it down for sometime and remove the excess moisture before pan frying. 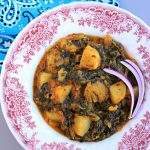 I am still leaving the fresh spinach picture from my last post as I don’t want to miss on that memory. The rest of the pictures are updated as I did not have any step by step cooking pictures. 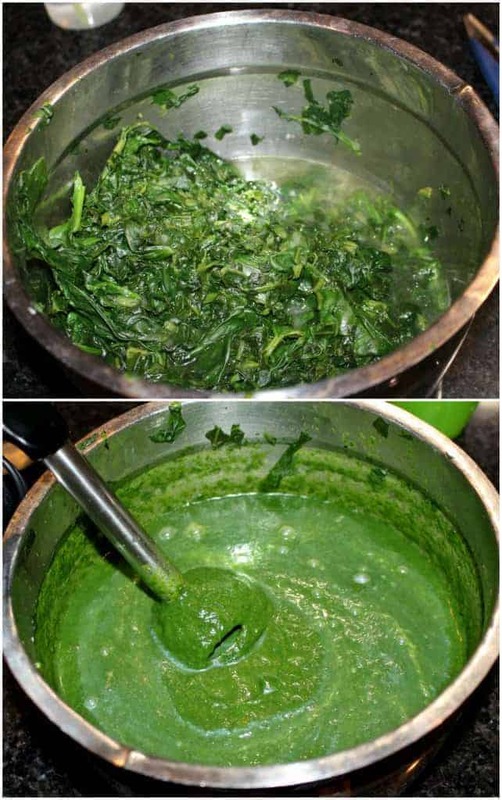 Wash the palak and chop it coarsely. Heat some butter and fry the palak until it shrinks. Allow it cool and then grind it into a smooth paste. 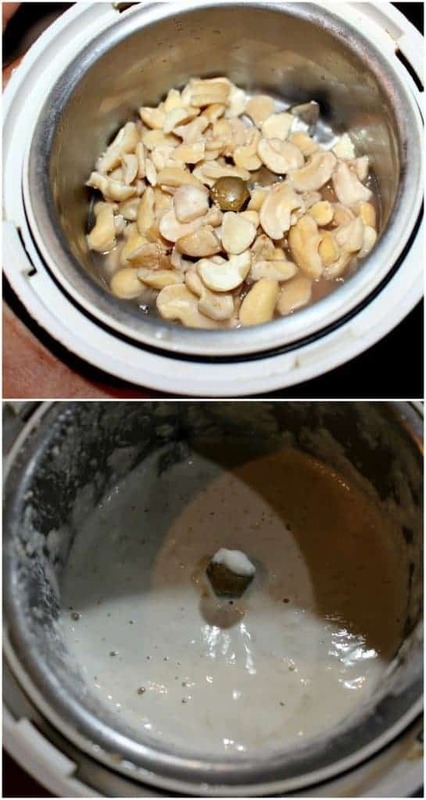 Soak cashews and poppy seeds for 10 mins and grind it into a smooth paste. 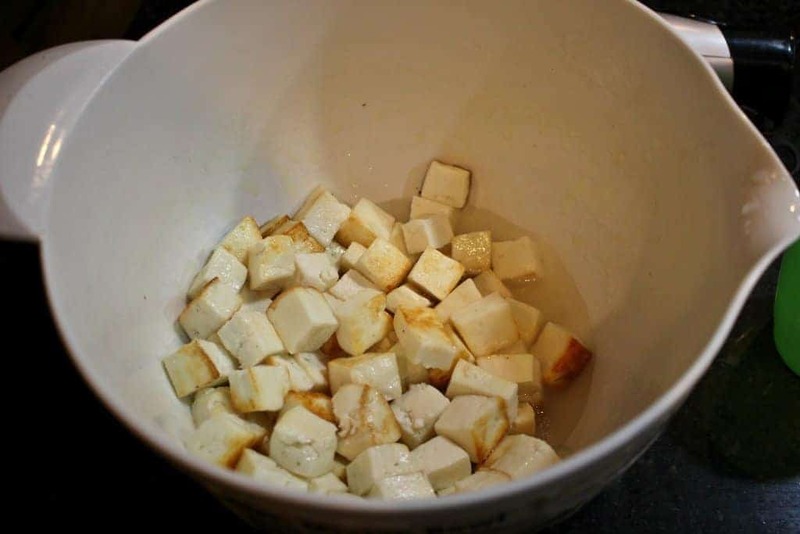 Cut paneer (Tofu) into small cubes and shallow fry it in little oil/butter until its light brown and transfer it to a bowl with warm water. The water keeps the paneer soft. Heat the rest of the butter/oil in the same pan and fry the onions until golden brown. 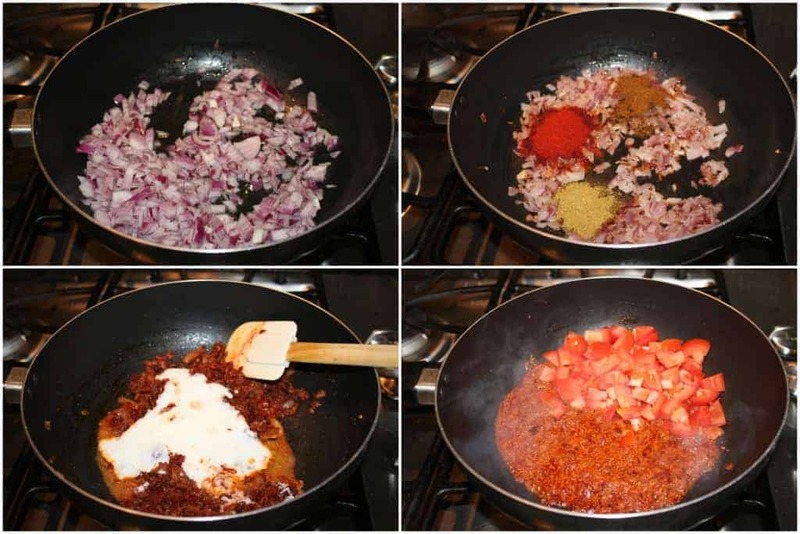 Now add the dhania powder, jeera powder, chilli powder and the garam masala powder. Stir for couple of minute and then add the whipped curd. Cook in reduced flame until the oil floats on top. Now add the tomatoes and mix well. Cook until the tomatoes are soft. 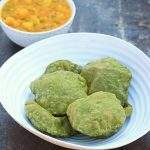 Add salt, sugar, ground palak leaves, turmeric powder and cook for few minutes. 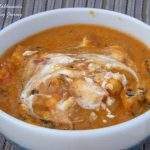 Now add the cashew poppy paste and add just enough water to bring the gravy to the required consistency. Cook in medium heat until the gravy is thick. Now add the fried paneer (tofu) and let it come to a boil once. 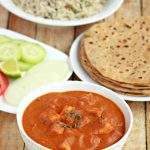 Sprinkle the rest of the garam masala powder and serve hot with parathas or rotis. This is one of those tofu dishes that tastes just as good as the one with paneer. Healthy and delicious. 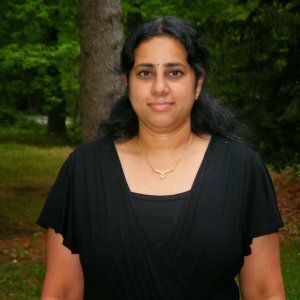 I agree with pavani that this is one of few recipes where tofu and paneer can interchangeably used. 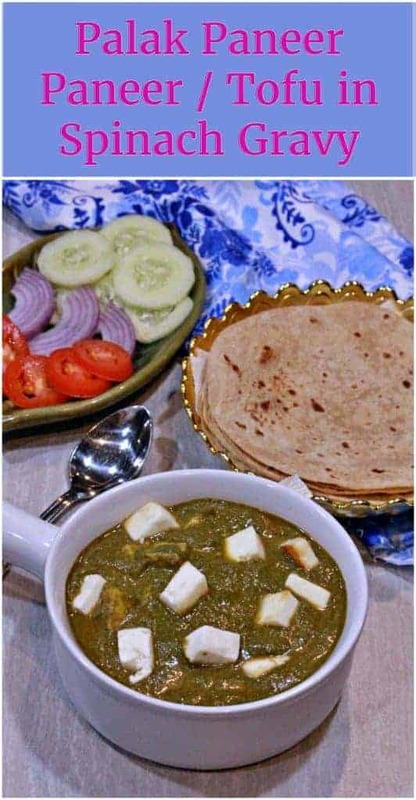 I too love making this with paneer and tofu, the new pics looks great. 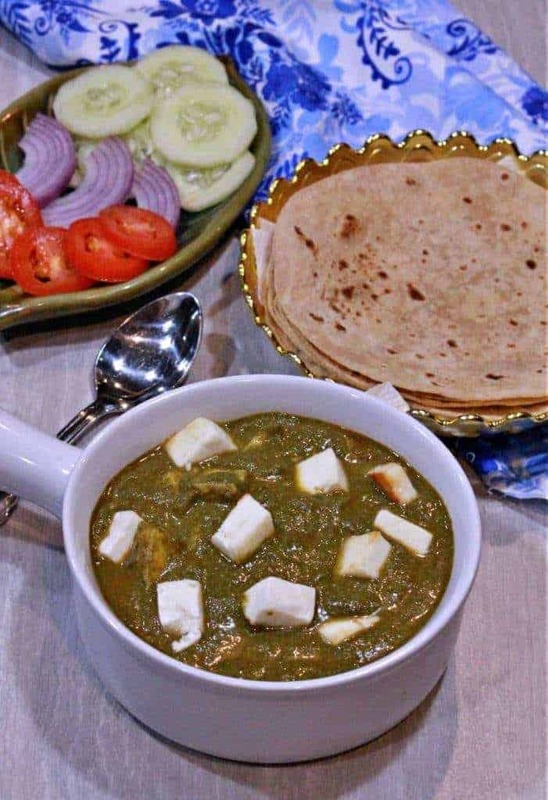 Nice twist to Palak paneer…looks delicious! I can have this ultimate palak paneer/tofu with some rotis without any fuss, my all time favourite dish. Looks delicious sandhya! would love to have a bowl as such! Warm and comforting! 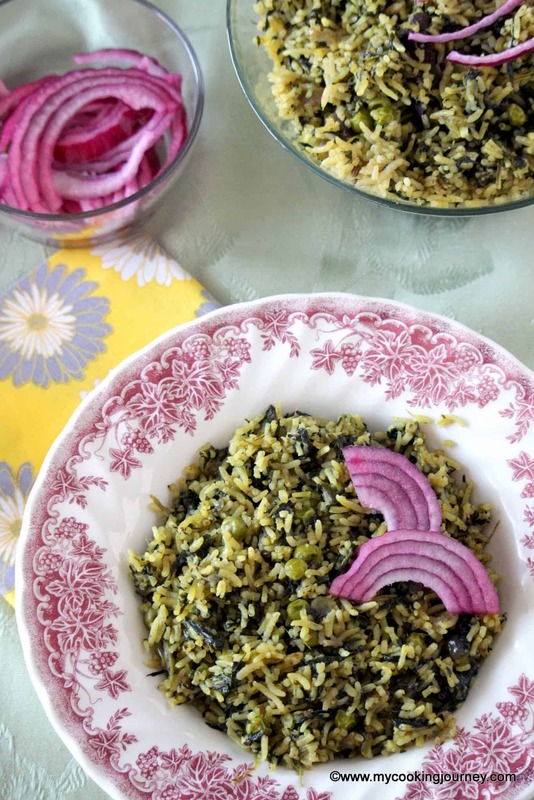 This is one of those mild, yet flavorful dishes that I love. 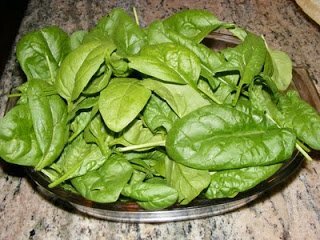 I love the vibrant creamy color of the spinach. 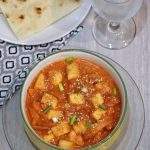 Addition of tofu is a nice variation from paneer.